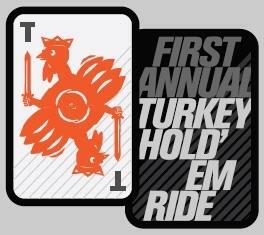 RESCHEDULED FOR DECEMBER 8th - Due to the unhealthy air quality levels, we have made the difficult decision to postpone the First Annual Turkey Hold 'em ride. The event will now take place on Saturday, December 8th. Join us on Saturday November 17th for a mixed terrain poker ride, where riders or teams of 2 will find their way to 5 unique locations (to be named on the day of the event) where they will receive 1 playing card at each location. The 5 cards that each person/team will receive will make up their poker hand. Riders will select their own route to reach of the unique locations, jumping between dirt and road sections. It will be a choose-your-own adventure, a scramble and a test in route planning. The ideal bike for this event will be a gravel bike, but a hard tail mountain bike would be a good choice, as well.There will be prizes for the best poker hands and other fun awards. This will not be a timed event, as it will be about having fun and raising money for two great causes. 100% of all proceeds will be split between MCBC and local food banks. Because you love riding your bike and you want to help raise money for local charities. This is going to be an incredible day on the bike. A great adventure. And a fun way to enjoy our spectacular back yard. 7:30am - join us for coffee by Equator and fill your bottles with Osmo. The 5 check points will take you through the headlands and across Mount Tam. The ride will take between 2.5-4 hours depending on route and pace. There will be plenty of climbing. There will be one official stop to refuel. You must register ahead of time. FOOD DRIVE: Help us collect 600 pounds of food for the SF Marin Food Bank. We will have collection bins at Studio Velo from Tuesday, 11/13 through Sunday, 11/18.